The overshoot model is intended primarily to help contractionary leaders strategize overshoot reversal in a post-revolutionary situation and to guide the attendant ENL analysis. However, it is also useful in a pre-revolutionary situation for characterizing contractionism and its alternatives. The following figure depicts these options. In each case only the impact limit is shown because this reflects the critical, immediate task: reversal of impact overshoot. The current, business-as-usual approach is capitalist growth, which leads the world economy away from the impact limit and is thus ecocidal. Left-liberal growth differs from this only in its insistence on higher ecological efficiencies. However, such improvements are impossible under capitalist logic, and they are inadequate because economic growth continues. Green reformism typically proposes economic contraction and higher efficiencies, but falsely assumes that these can be achieved in a capitalist context. Contractionism's solution is the revolutionary replacement of capitalist logic with ENL logic for guiding purposes, followed by rapid contraction and sharp increases in ecological efficiencies. Each box is shaded based on the economic logic — and implicitly the group holding political power — assumed by the option's proponents. Point Z represents humankind's current overshoot position. The figure begins at top left with the present reality: capitalist growth. As indicated by the arrow at point Z, this option supports economic expansion — increases in population and consumption — as required by capitalist logic. The shorter arrow indicates that this logic permits only modest increases in ecological efficiencies: under capitalism, unprofitable improvements are rejected except under strong social compulsion. The result of these two factors is the continuation of hyper-expansion and the inevitability of ecological collapse. The next option is left-liberal growth. This refers to the left-wing politics of the many progressives who are dedicated to social fairness but cannot conceive of an economic system beyond capitalism. Given this limited historical perspective, they are forced to support economic growth as the only way to provide the populace with sufficient jobs and income. 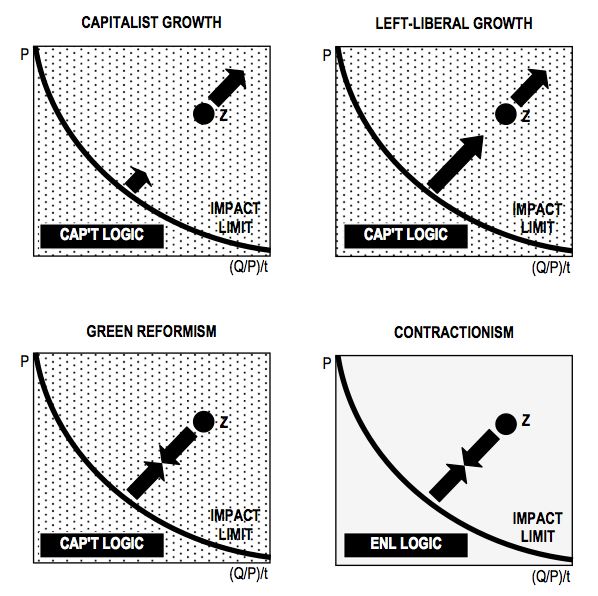 As shown in the figure, left-liberals try to overcome the environmentally destructive effects of growth by positing radical improvements in ecological efficiencies. The fact that such improvements contradict the capitalist logic they embrace is simply ignored. The third option is green reformism: support for changes that reduce an economy’s ecological impact while retaining the current logic. As can be seen, the proposed solution is very similar to that of contractionism. Most green reformists insist that economies must contract and that ecological efficiencies must be greatly improved. However, this option ignores the central fact that such changes contradict the economic logic of capitalism. This logic is growth-dependent and, as noted above, limited its capacity to improve ecological efficiencies. Green reformism must be dismissed because it is conceptually incoherent and because it profoundly misleads people who are genuinely concerned about the ecological crisis. The last option is contractionism. Uniquely, this assumes that a revolution has replaced the capitalist class with contractionary leaders, and that ENL logic has replaced capitalist logic for economic guidance. Contractionism supports rapid contraction, as indicated by the shift in point Z towards the origin, and sharp increases in ecological efficiencies, as indicated by the second arrow's shift away from the impact limit curve. The result is that point Z meets the impact limit curve, thereby reversing the overshoot condition.